The Minister of Labour [Aneurin Bevan] said that he had always been opposed to the introduction of charges for dentures and spectacles. In his view it would be undesirable in principle, and politically dangerous, for the Labour Party thus to abandon the conception of a free Health Service. Now that he was aware of the details of the budgetary position he was able to add the further argument that this step was not financially necessary. In a Budget of over £4,000 million it should not be difficult to find so small a sum as £13 million in some other way which would not breach the principle of a free Health Service. He was especially disturbed at the prospect that this inroad on the Health Service would be justified by the argument that the money to be saved was needed for the increased defence programme. He himself believed that the shortages of raw materials and machine tools would make it impossible in practice to spend effectively all the money which was to be allocated under his Budget defence programme; and in this view he had the support of the President of the Board of Trade [Harold Wilson] and the Minister of Supply [George Russell Strauss]. The Defence Estimates for the coming financial year totalled £1,250 million; and of this the estimated cost for defence production amounted to £510 million. These were large figures and must be subject to a large margin of error. He believed that, within the margin, the Chancellor [Hugh Gaitskell] could have found the savings which he proposed to secure by introducing charges under the Health Service. The Minister reminded the Cabinet that such charges could not be imposed without fresh legislation. Believing, as he did, that such charges would involve a serious breach of Socialist principles, and having on numerous occasions proclaimed in public speeches his opposition to such a course, he did not see how he could be expected to vote in favour of such a Bill. If the Cabinet reaffirmed their decision that these charges should be imposed, he would be obliged to resign from the Government. (a) The Minister of Labour [Aneurin Bevan] and the President of the Board of Trade [Harold Wilson] thought the Government would find great difficulty in persuading their supporters in the House of Commons to accept this departure from the principle of a free Health Service. They considered that some Government supporters would abstain from voting in favour of the legislation authorising the imposition of these charges; and they pointed out that, if only a few Government supporters abstained, the Conservative Opposition, by voting against the Bill, could bring about a major Government defeat. In that event the Government would face a General Election in circumstances which would enable the Conservative Party to pose as the champions of the free Health Service. The Home Secretary [James Chuter Ede] also feared that there might be considerable Parliamentary difficulty in securing the passage of the legislation. 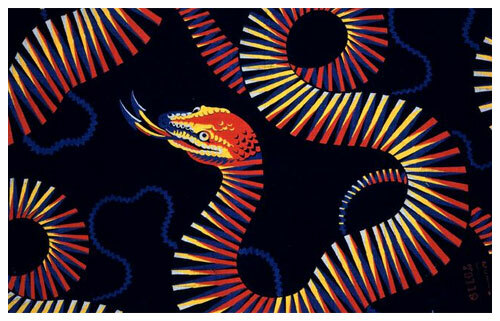 On the other side it was pointed out that, so far as concerned legislation, the principle of a free Health Service had already been breached by the National Health Service (Amendment) Act, 1949, which authorised the impositions of a shilling charge for prescriptions. This legislation, which the present Minister of Labour had himself introduced, had encountered no substantial opposition from Government supporters. It was not until it had been passed into law that the Government had decided not to proceed with their plan for making a charge for prescriptions. 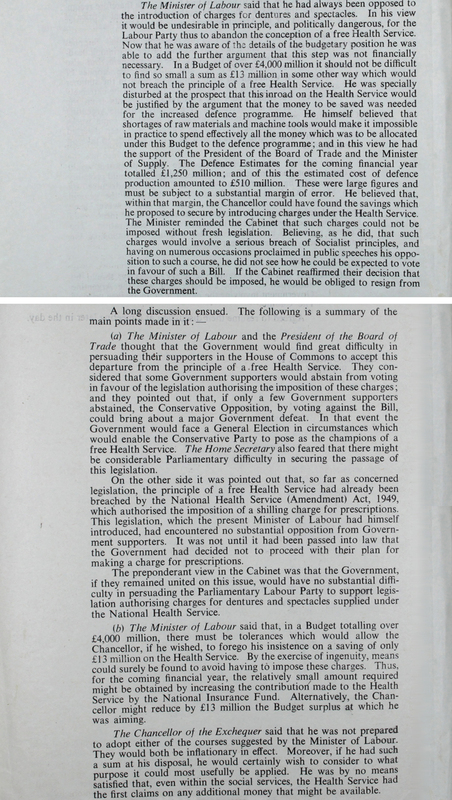 The preponderant view in the Cabinet was that the Government if they remained united on this issue, would have no substantial difficulty in persuading the Parliamentary Labour Party to support legislation authorising charges for dentures and spectacles supplied under the National Health Service. (b) The Minister of Labour [Aneurin Bevan] said that, in a Budget totalling over £4,000 million, there must be tolerances which would allow the Chancellor [Hugh Gaitskell], if he wished, to forego his insistence on a saving of only £13 million on the Health Service. By the exercise of ingenuity, means could surely be found to avoid having to impose these charges. Thus, for the coming financial year, the relatively small amount required might be obtained by increasing the contribution made to the Health Service by the National Insurance Fund. Alternatively, the Chancellor might reduce by £13m the Budget surplus at which he was aiming. The Chancellor of the Exchequer [Hugh Gaitskell] said that he was not prepared to adopt either of the courses suggested by the Minister of Labour [Aneurin Bevan]. They would both be inflationary in effect. Moreover, if had such a sum at his disposal, he would certainly wish to consider to what purpose it might be usefully applied. He was by no means satisfied that, even within the social services, the Health Service had the first claims on any additional money that might be available.